Depending on your speed, your height (or more accurately the height of your centre of mass), and the angle of the slope you are on, there are 3 different types of edge catch, slow, pivot and flying. The slow edge catch happens when you are traveling very slowly and catch an edge, normally at sideways speeds no more than about 5km/h (3mph). This is where catching the edge just sends you off balance, and with the edge caught you can't move your feet to regain your balance. You then sit or kneel down sharply to avoid falling all the way over, so that it hurts less. This is by far the tamest, and nicest type of edge catch, but be careful as people still break their wrists occasionally by trying to use their hands to soften the impact. The Pivot Edge Catch happens when you are going a bit faster than the slow edge catch, and when the edge catches you are not so much sent off balance, but suddenly thrown forwards or backwards. This takes your body away from over the edge too quickly to recover by sitting or kneeling down, and instead the caught edge acts like a pivot throwing your body at the snow. This is the type of edge catch where you impact the snow the hardest directly, as all your energy is transferred straight into the snow. This type of edge catch generally happens when your initial sideways velocity is between about 6 and 11km/h (4 and 7mph), although the maximum speed at which a pivot edge catch can happen changes depending on the height of your centre of mass. 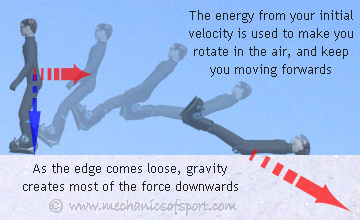 The differences that can be made and why they happen are explained in more detail in the Edge Catch Mechanics section. 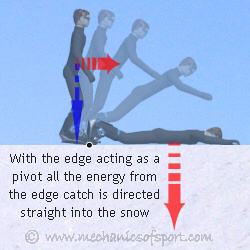 The pivot edge catch should be respected, because all the energy in a pivot edge catch gets directed straight into the snow, it means that a snowboarder can hit the snow quite hard even if they weren't moving that fast. 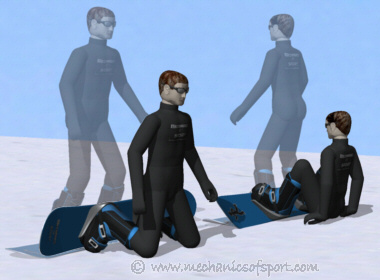 For an average snowboarder catching their edge at 11km/h (7mph), their body will hit the snow at 19km/h (12mph) and their head will hit the snow at 32km/h (20mph). This means their head will hit the snow 1.6 times harder than if then had fallen from their head height. The flying edge catch happens when your initial sideways velocity is so fast that when the edge catches, the rotation it creates lifts the edge out of the snow. This makes you come spinning into the air, continuing to rotate until you hit the snow. This generally happens when you catch an edge with a sideways velocity of more than about 11km/h (7mph). Although there is more overall energy in a flying edge catch, you actually impact the snow downwards with less force than you would with a pivot edge catch. There is still some forwards velocity to contend with however, but this is often dissipated more slowly by sliding across the snow. Sliding to a halt will only happen up until a point though, as if you are going too fast you will be unable to slide and will end up tumbling across the snow. 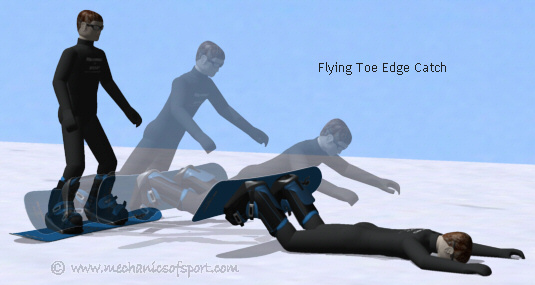 This is when the flying edge catch is the most dangerous, as when you tumble across the snow it is not uncommon to land on your head and limbs individually as you roll, with them hitting the snow a lot harder than they would have otherwise. 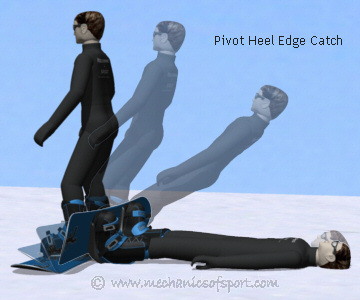 So although your head might not directly impact the snow with as much force initially as it could have from a pivot edge catch, you might land on your head while you are tumbling which can make it hit a lot harder. Overall we see the transitions between the types of edge catch, happen at fairly low speeds, although this is sideways velocity, not forwards. However it is still worth noting that you only need to catch an edge at about 8km/h (5mph) for it to hurt considerably. The velocities talked about so far are sideways velocities, and the effects of a snowboarder's forwards velocity have not been included. That is partly because it often doesn't matter much as a lot of edge catches happen when the snowboard is going almost completely sideways, and partly because the effect forwards velocity has can vary. Generally when you catch an edge, most of the forwards velocity will still be there as you hit the ground, so you will also be moving sideways as you hit the snow, but forwards velocity can also make the edge act differently while it is catching. Edges are curved, and like to travel along this curve when they have forwards speed. Because of this, if a snowboard has a reasonable forwards velocity, and not much sideways velocity when an edge catches. The edge can lead the board around in a curve and turn the caught edge into the trailing edge, recovering from the edge catch. This means having forwards velocity makes it possible to recover when an edge starts to catch, and that you are less likely to catch an edge if you are traveling mostly forwards along the snowboard. However there is still the chance that the edge snaking around you will make lose your balance and let the leading edge catch. On to the Why Snowboarders Catch Edges section.